The John Cotton Dana Library Public Relations Awards are the Holy Grail for PR librarians in the U.S. Winning one takes plenty of time, effort, talent, and planning. Some say that completing the award application is an experience unto itself. But it’s also a lesson in the way good public relations should be done. Baltimore County (Md.) Public Library’s (BCPL) Storyville, a new interactive creative learning center, was designed as a child-size village for preschoolers and their caregivers. Gwinnett County (Ga.) Public Library wowed its community with its Oct. 18, 2008, reading festival. The Library Foundation of the Multnomah (Ore.) Public Library developed and sustained an appropriate marketing strategy that conveyed the importance of the library in early childhood literacy. Ypsilanti (Mich.) District Library scored a huge hit with a program targeting teens and men with a celebration of the area’s musical heritage. The July 13 awards ceremony was at the Ritz Carlton, and it was as classy as ever. (Is that redundant?) 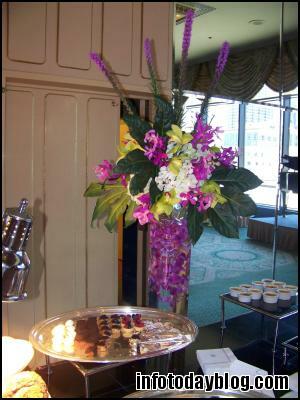 Admist a spread of orchids, candles, and amazing hors d’ouevres, attentive waitstaff fussed over the well-dressed guests who nibbled while they enjoyed live piano music and waited for formal proceedings to begin. H.W. 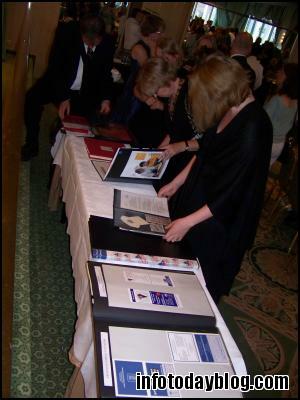 Wilson and its Foundation still sponsor the award, and as President Harry Regan commented when he opened the festivities, “Over the last 63 years, the John Cotton Dana Award has evolved into the one of the most coveted and prestigious awards” in libraryland. People studied the winning JCD notebooks. You can read more about the contest on Wilson’s website. All in all, it was a grand afternoon at the Ritz, where well-deserved honors were bestowed by a committed corporation that continues to encourage and reward librarians who do the tough but essential work of planning great public relations projects that keep the people of American coming back to rediscover the wonders of their libraries year after year. Kathy Dempsey introduces her first book. Libraries magazine and current editor of Marketing Library Services newsletter, has a new moniker to add to her list of credentials: book author. 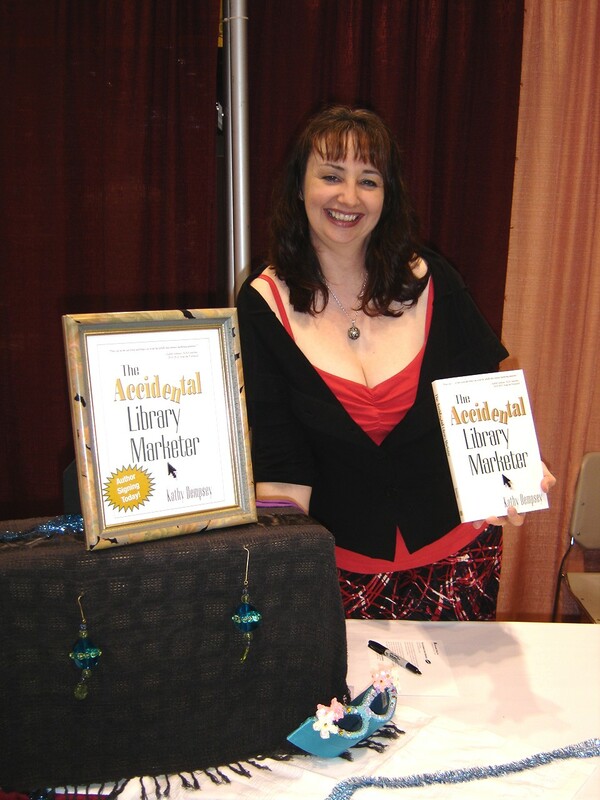 Dempsey, who just published The Accidental Library Marketer, was busy talking to library marketers and autographing copies of her new book during the ALA Swap & Shop on Sunday. “I’m ridiculously relieved that the book is finished, I’m happy with the way it came out, and I’m very thrilled with the response the book is having in the marketplace so far,” says Dempsey. Penning the 75,000-word manuscript was “a lot harder than I ever thought it would be,” she says, noting that she started writing in March 2008 but put her creative efforts on hold temporarily to help out with the Shanachie book project. “The reception that I’ve received about the book has gone far beyond my expectations,” she says. But the book buzz is just beginning. For library professionals and paraprofessionals who need a hand negotiating new marketing strategies on the internet, this book is destined to be a guidebook for all the game plans and initiatives to come. The book, says Dempsey, offers some of the best, proven ways for find funding and building solid relationships with users and the community. 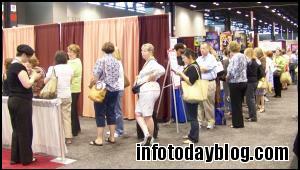 For more information, stop by the Information Today, Inc. booth (#4525) or visit www.infotoday.com. The Swap & Shop Always Draws a Crowd! The crowd lined up around the corner waiting for the Swap & Shop to open. The annual Swap & Shop is where savvy marketers go to get examples of what their colleagues have been producing as far as brochures, annual reports, giveaways, and other promotional products. It’s also the site of the Swap’s Best of Show awards as well as a place to meet those marketing listserv buddies in person. This shows just some of the PR Masterpieces that were on display to help others learn about good PR materials. This year’s theme was PR Masterpieces, and plenty works were on display. 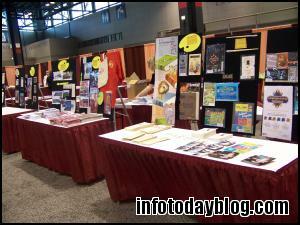 This year’s Swap drew more than 800 attendees in the 2.5 hours it was open in the back of the exhibit hall. Library marketing is alive and well!